Bodysurfing is fun. Especially when the surf is small to non-existent. Shorebreak makes for easy entertainment. Handplanes, or mini surfboards attached to the hand, enhance the experience of using one’s body to slide across small, open faces by adding lift and speed. In fact, using handplanes can be an absolute hoot. 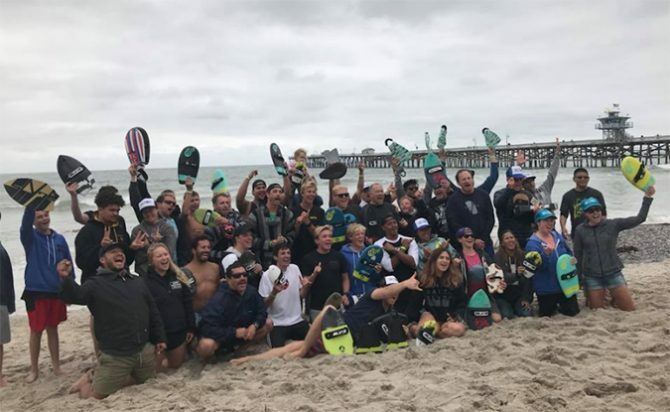 Just ask the 50-plus competitors and a sea of enthusiastic onlookers that showed up for the 2nd Annual Slyde Handboards Charity Handboarding Competition in June. According to organizers, bodysurfing legends like Sean Enoka and Keali’i Punley of Hawaii, alongside local Southern California talent like Mark Drewelow and Makena Magro made for a stacked competition pool. Divisions included teens, women, men (20-48) and men (49 and over). The laid back vibe and diversity of contestants created more of a community atmosphere than competition. Body Whompers Unite: Competitors at the 2nd Annual Charity Handboarding Comp.